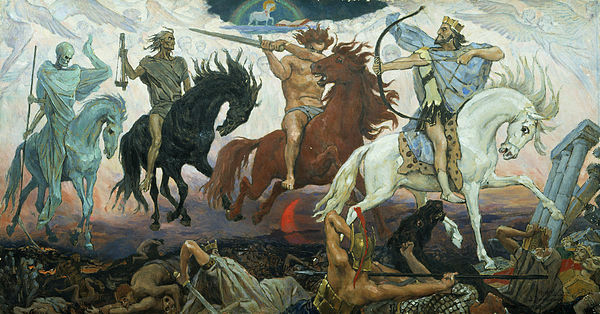 The Four Horsemen of the Apocalypse, by Russian artist Victor Vasnetsov, 1887.
episode I used the illustration for the First Horse (the White Horse), which includes the Greek Cross in a circle which became a very popular symbol of Jesus Christ. In the Eastern tradition, the letters IX XC Ni Ka are superimposed, the first pair to the left and right above the bar and the second pair left and right below the bar. Consistent with Revelation 6, together they mean Jesus Christ Victor (or Conqueror) over Death. 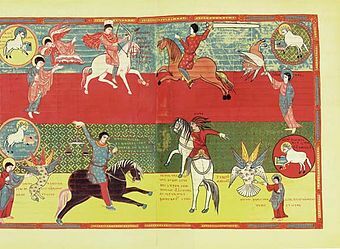 Another set of Revelation illustrations is found in an 11th Century collection in Paris, the Saint-Sever Beatus, which is based upon an earlier set of illustrations from the 7th Century in Spain. In future episodes of the Revelation series, I will use as many of these historic works as I can to illustration the various scenes in St. John’s narrative of his visions. 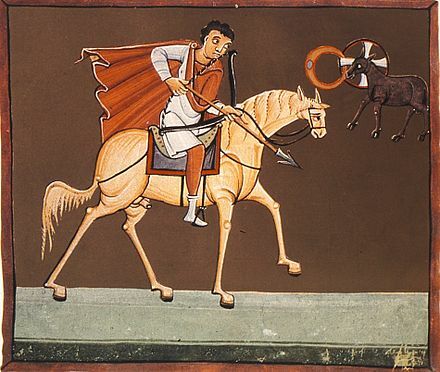 The Podcast Homily for Third Sunday After Trinity is relatively short, focused on 1 Peter 3:5b-11 and Luke 15:1-11, the first a lesson in the Christian virtues of humility and persistence under threat from the Evil One and the latter two parables, the Lost Sheep and the Lost Coin. Listen to the Podcast Homily. Thanks to each of you for your support of The Anglican Internet Church online ministry. May God bless you in all that you do in His Name. Amen.